(Bloomberg) -- Banca Carige SpA, the Italian lender under European Central Bank administration, will be able to find a partner and avoid a state rescue, said a key coalition lawmaker. Carige is the latest Italian bank asked by the ECB to bolster its finances. Faced with a potential failure, Italy’s cabinet last month approved measures to support Carige’s liquidity and funding and signaled its support for a possible recapitalization. ECB-appointed administrators plan to shore up the bank’s balance sheet, by reducing bad loans and firming up a business plan to make the lender more attractive to a possible partner. The main hurdle to find a partner is the unfounded expectation by a possible investor that the current government may arrange a takeover of Carige the way the previous one did with the heavily subsidized sale of two Veneto-based banks to Intesa Sanpaolo SpA, said Borghi. “If Carige fails to combine, the bank will be nationalized in compliance with the current rules,” Borghi said. Borghi said the Italian banking system is solid but it’s hampered by European rules on so-called bail-ins and by the way government bonds are treated as assets that carry risk on the balance sheets of lenders. 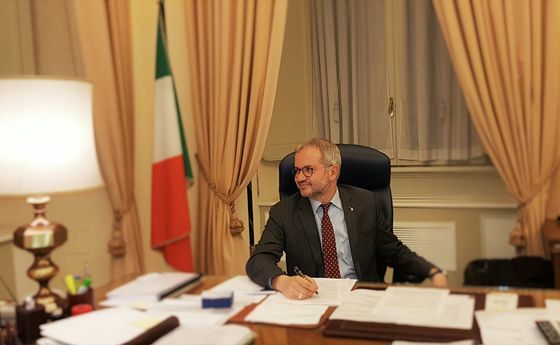 In a sign of his views on Europe, the EU flag in Borghi’s office was hidden behind a curtain while the Italian one stood on display.